A perspective from Carlo Alberto Pinelli (President of MW Italy ) regarding the evolution of the huts construction and mountaineering in the Alps. In its “Voyages dans les Alpes”, Horace Benedict de Saussure wrote that his early attempts to reach the summit of Mont Blanc would have been more successful if the guides he had recruited in Chamonix had not always insisted on completing the ascent in a single day, between dawn and dusk. “The local people do not believe”, he wrote”, that one can attempt to spend a whole night in the open on the ice without serious consequences”. 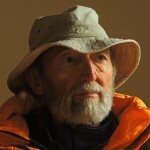 When we try to imagine the difficulties, the fears, the psychological blocks that limited the exploits of the founding fathers of vertical tourism, we often think of the unsuitable materials and clothing, the fear of the unknown, their too rudimentary knowledge of the mountaineering skills needed to overcome the steep icy slopes or snow bridges over crevasses, and so forth. And we fail to take properly into account what was for many years one of the most serious obstacles with which our predecessors had to contend. To step victorious onto a summit called for more than merely being able to overcome the technical difficulties and the unknown incidents that the chosen path presented: one or more nights in the open, at inhospitable heights and places, where no sensible person had hitherto thought it possible to fall asleep without automatically waking in the Hereafter. In other words, the success of mountaineering in its infancy depended largely on conquering the night. A conquest that – like many others – concealed the germs of many of the serious contradictions and degenerations to come. and eccentric hunter Jacques Balmat of Chamonix. During an attempt by guides from the valley to reach the summit of Mont Blanc Balmat was abandoned by his companions and after becoming lost was brought to a halt by the dusk and an enormous crevasse. He endured an interminable and uncomfortable stormy night which, though certainly not a pleasant experience, was not sufficiently traumatic to persuade him to abandon the “race to the top”. It was he, in fact, who in the following year, together with the fearless doctor Michel Paccard, first reached the summit, after another night in the open, on that fateful 8th August 1786 which is today considered, rightly or wrongly, as the official birthday of alpinism. Benedict de Saussure, who had, so to speak, “sponsored” the venture, also reached the summit the following year, accompanied by eighteen guides, a personal valet and a case of Champagne. To facilitate the achievement de Saussure had previously ordered to build along the route two rudimentary stone huts. The second of these, on the Grands Mulets, resisted for a few winters – though its precise location is no longer known – and can rightly be considered the prototype for all high-altitude Alpine shelters. 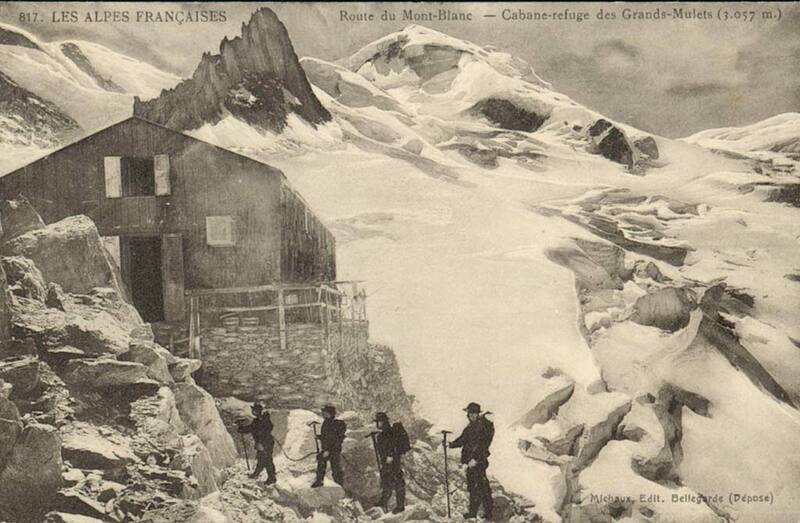 However, the time was not yet ripe for such constructions and it was not until 1853, when the ascent of Mont Blanc was becoming fashionable for the more adventurous tourists, that the guides of Chamonix decided to build a proper wooden and stone hut on the Grands Mulets. As one might imagine, it was a fetid hovel with not the faintest trace of comfort. No sleeping berths or boards to sleep on; visitors had to bed down as best they could on piles of straw reduced to a foul-smelling litter. Strange as it may seem to us, accustomed as we are to much worse devastation, that early timid attempt to “anthropise” the Alpine wilderness was widely contested and denounced as an act of profanation. It is enough to replace the antiquated term “picturesque” with the more modern “natural landscape” to realize how surprisingly modern is this phrase. I confess I should not mind shaking the hand of that unheeded prophet: his sensitivity may have appeared and even still appear excessive, but his inner eyes had surely seen far into the future. From the middle of the nineteenth century on these still extremely spartan huts spread throughout the Alps, and by the beginning of the twentieth century the Italian Alpine Club alone owned almost one hundred. It must nonetheless be recalled that these constructions remained unobtrusive, rudimentary and often not without a certain charm. If their silhouettes inevitably detracted from the superhuman majesty of their surroundings, they also helped to endow that same superhuman majesty with something intelligible against which to measure it: in other words, the immediate contrast allowed a more intense interpretation. In my opinion nobody has described with greater sensitivity than Samivel the precious function of cultural and emotional intermediation offered to alpinists by the isolated huts of the old days. the abyss is impressive. Almost everywhere, the “fragile ark” has been swept away to make room for overly solid “ocean liners” within which guests find far too many of the comforts they left behind on the plains; including, obviously, overcrowding. But it is not enough to place all the blame on the enormous increase in visitors to the mountains, as this tends to accept what has happened as an ineluctable destiny and absolves all the various alpine clubs, local tourist organizations, travel agencies, guides’ associations, etc. 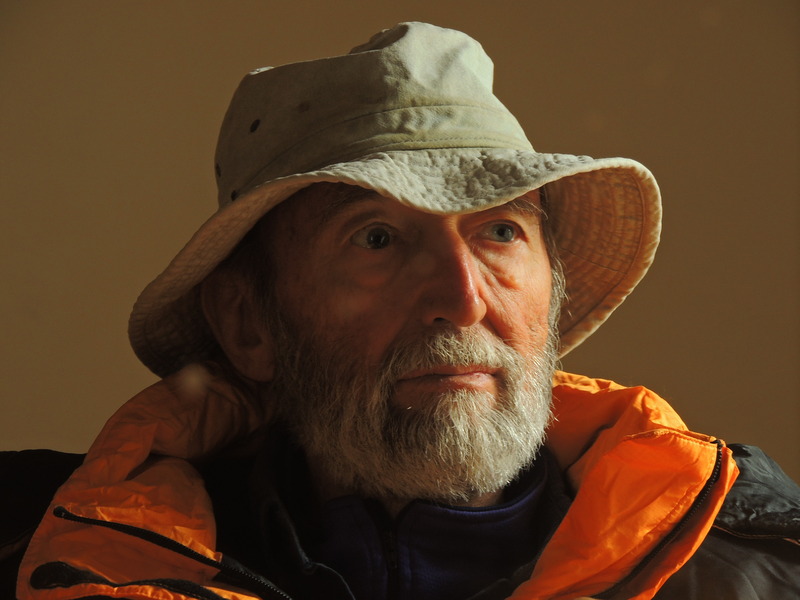 of all responsibility for indiscriminate policies to encourage all forms of mountaineering. It is certainly no longer possible to point to the exact moment when respect for the environment, for discretion and simplicity, was abandoned in favour of the approach that has led to the present excesses of bulkiness and comfort. The refuge that best exemplifies the more questionable aspects of the “conquest of the night” at high altitudes is without doubt the Regina Margherita hut on Monte Rosa. In the first place because it was the first hut to be built on the very top of a major mountain; then because the summit was mined and flattened in order to build it; and finally because the ostentatious and inappropriate renovation completed about thirty years ago was one of the most pitiful examples of the cultural backwardness of large sectors of the Italian Alpine Club. Today I am not alone among “romantic” alpinists in thinking that the day of reckoning has come for mountain huts and that the whole global problem urgently needs to be reviewed. If these huts are allowed to continue to proliferate out of hand, the conquest of the night will soon become the defeat of the day. By which I mean a debasement of the authenticity that high altitudes can still offer to those who approach them directly, with no superfluous props and “crutches”. Today another insidious step is being taken towards corrupting the inner experience of the mountains. It is insidious precisely because it seems positive. I have often wondered why I feel uneasy when I see photos of huts and bivouacs built from avant-garde plans signed by veritable architects. 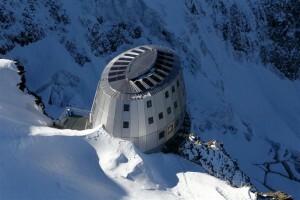 I am thinking of the new Gonella hut by the Miage glacier, of the “space-age” bivouac dedicated to Gervasutti at the foot of the east face of the Grandes Jorasses, of the brand new shining Gouter “colosseum” on the classic French route to Mont Blanc. than architecturally insignificant life rafts: emergency holes, devoid of any visual stylistic evidence that might parade the age in which they were built. The architectural devices that mark the huts and bivouacs to which I refer instead send out a dual message that is both mystifying and arrogant (albeit only mildly so, for the time being): firstly, human beings can “embellish” the mountain wilderness just as they wish and, secondly, they are therefore entitled to impose on that wilderness the indelible signs of their own history, born in the world of the plains. Thus the spatial taming caused by the outsized huts is compounded by a parallel and no less harmful taming of the last “timeless” natural dimension we were fortunate enough to inherit.